I thought of this stamp when I saw the pretty colors that Jaclyn Miller picked out for The Play Date Cafe Challenge #85 this week. I've only used this Impression Obsession stamp once before and I paper pieced it, so it was fun getting to practice with my Copics on these pretty Cabbage Roses today. Thanks for stopping by and taking a look. Wow, Donna, this is gorgeous. I love this stamp and what you've done with it is wonderful!! Looks like you had fun coloring those roses, Donna. I loved coloring as a kid, and it's so much more fun with Copics as a grownup! THanks for playing with us at THe Play DAte CAfe. Hi Donna, your cabbage roses are stunning! I wish I had more urge to color. You've done a great job with this week's colors too! 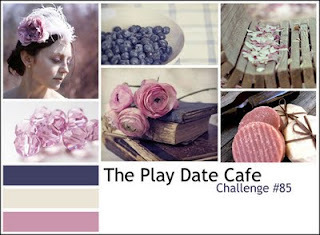 Great to have you playing at The Play Date Cafe.